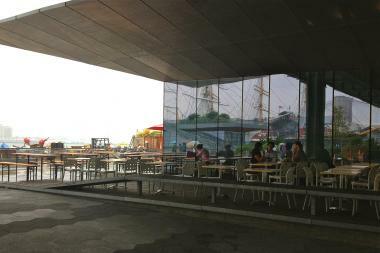 The FDR Bar sits south of Pier 15's Watermark Bar. The entire section of the East River Waterfront just got free Wi-Fi, the Downtown Alliance announced. MANHATTAN — Getting online just got even easier Downtown. Free Wi-Fi launched Monday across a broad swath of the Financial District, including parts of Water, Fulton, Front and Stone streets, as well as a section of the East River Waterfront, the Downtown Alliance announced. The new online access covers Piers 6, 11 and 15 along the East River, as well as Imagination Playground, Peter Minuit Plaza, Water-Whitehall Plaza, Queen Elizabeth II September 11th Garden and other public spaces. "Connectivity is the key to success in today’s global economy," William Bernstein, acting president of the Downtown Alliance, said in a statement. “With over 600 tech and innovation firms located below Chambers Street, this free Water Street Wi-Fi network will further advance Lower Manhattan as a destination for new firms looking to open their doors and will be a huge boon to the district’s workers, residents and tourists." The free Wi-Fi — available to laptop and smartphone users by clicking on the "#DwtwnAllianceFreeWifi" network — is part of a $4 million city Economic Development Corporation project to bring wireless access to 10 hubs across the city. Other new hot spots will include Cadman Plaza in Downtown Brooklyn, the Brooklyn Academy of Music and the Flatiron Building. Monday's launch marked the first phase of the Lower Manhattan Wi-Fi expansion, which will ultimately cover Water Street between Whitehall and Fulton streets, as well as neighboring side streets and all of Downtown's East River waterfront and piers. The Downtown Alliance hopes to finish the Wi-Fi installation by the spring. For a complete list of the new wireless hot spots in Lower Manhattan, click here.